Adam Noah Levine is an American singer, songwriter, multi-instrumentalist, actor and record producer. He is the lead singer for the pop rock band Maroon 5. 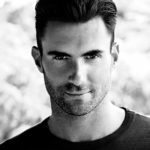 Born and raised in Los Angeles, California, Levine began his musical career in 1994, when he co-founded the alternative rock band Kara’s Flowers, of which he was the lead vocalist and guitarist. The band split up after their only album, The Fourth World (released in 1997), which did not gain popularity. In 2001, the group was reformed–with guitarist James Valentine joining the line-up and began a new musical chapter, changing their name to Maroon 5. In 2002, the band released their first album, Songs About Jane, which went multi-platinum in the US. Since then, they have released five more albums:It Won’t Be Soon Before Long (2007), Hands All Over (2010), Overexposed (2012), V (2014) and Red Pill Blues (2017). As part of Maroon 5, Levine has received three Grammy Awards, two Billboard Music Awards, two American Music Awards, an MTV Video Music Award and a World Music Award. "Nobody has it all, but for me to even come close is amazing." "I don’t know if it’s possible to live the rock ‘n roll lifestyle and still be romantic." "I’m extremely fascinated by marriage. I want to study marriage. I want to learn about it. I want to know it. I want to figure out whether or not I want to do it. I’m not just going to leap into it, because that’s not good for anybody." "I don’t think any relationship responds well to pressure."